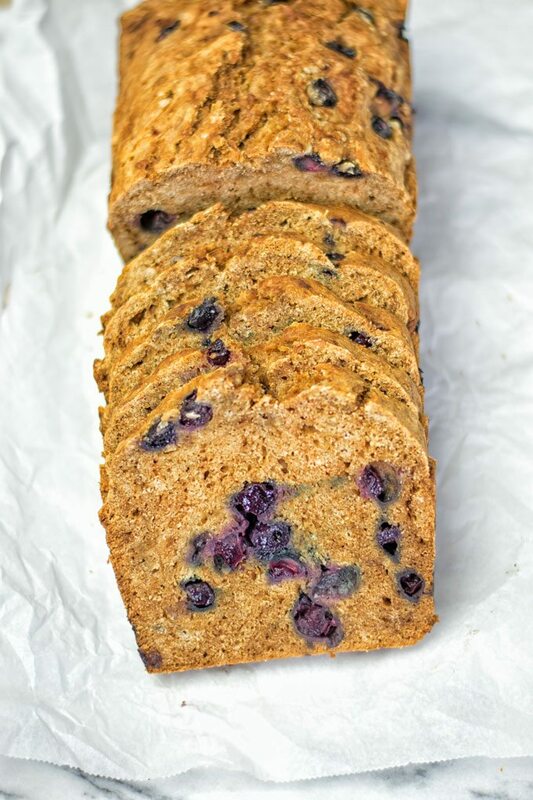 My new Gluten-Free Blueberry Bread is perfect for everyone who wants to enjoy a fresh homemade bread. It’s made from just 6 simple ingredients, and makes an easy vegan breakfast, snack, or even dessert. When I’m thinking about summer, a lot of seasonal ingredients come to my mind. Among them are Blueberries. Not only are these the ultimate summer fruits for me to use in my cooking. No, I can also simply imagine what summer brings to my vibes by looking at them. It does not take long and I’m literally feeling the beauty of being out there in the warm summer sun. I have to admit (and I think I have said it before) I’m a spring and summer kid. Which is why I am so happy now that even in the Netherlands, the temperatures are high and it feels and smells like summer. But let’s get back to blueberries. I’m not only attracted by the beautiful color of these fruits but of course also by their flavor. And the fact that they are versatile and easy to use at the same time. I have often found myself dreaming of a big piece of my Easy Blueberry Cobbler [vegan, gluten free]. Or in BBQ and grilling season like now then I’m up for the beautiful Blueberry Grilled Cheese Sandwich. 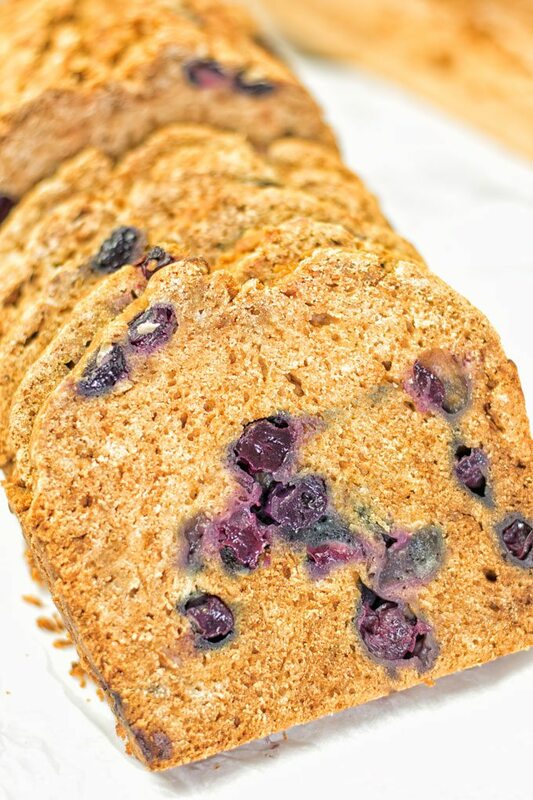 Today we are adding a Gluten-Free Blueberry Bread to that list. Regular ones are often made with butter and eggs, and that’s obviously not suitable for a dairy free and plant based lifestyle. I often saw that almost all other vegan recipes called for a lot of bananas. Don’t get me wrong, I think bananas are delicious for the texture and healthy, too. But I find they can mask the delicious blueberry flavor a bit. And that is something I don’t want to have. 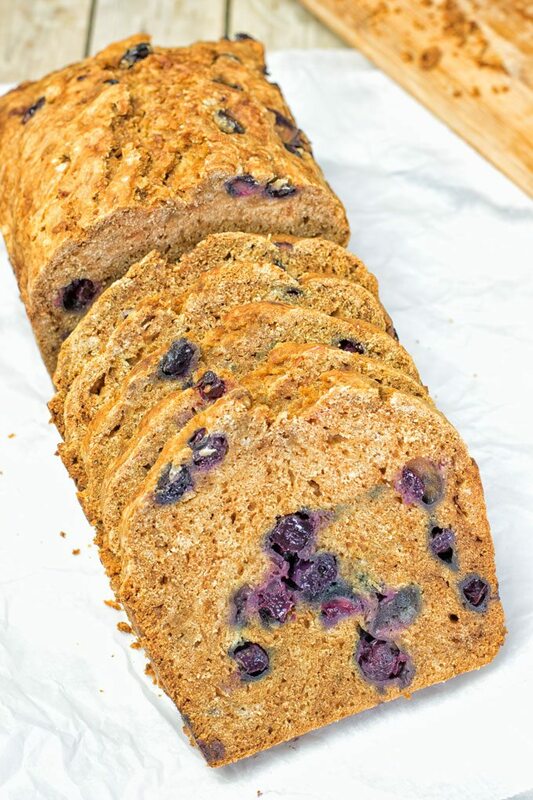 I don’t know about you guys but if I make a Blueberry Bread, I want to taste the blueberries. Otherwise, I can also just make a banana bread. 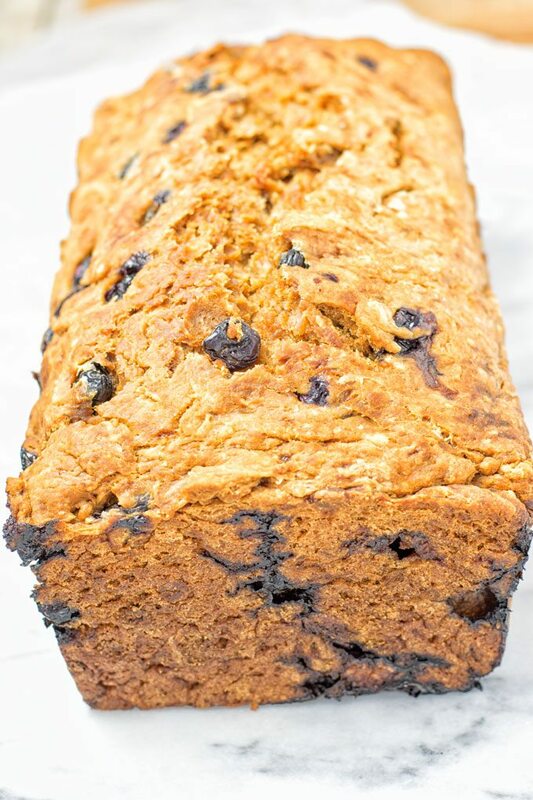 So I had to think about how I could create a Blueberry Bread which tastes as it should: summer fruity, juicy, delicious, smelling good, colorful, moist, drool worthy, mouthwatering. Oh hey we can continue this list for sure. Surprise! I managed to do just this. The wait is over. 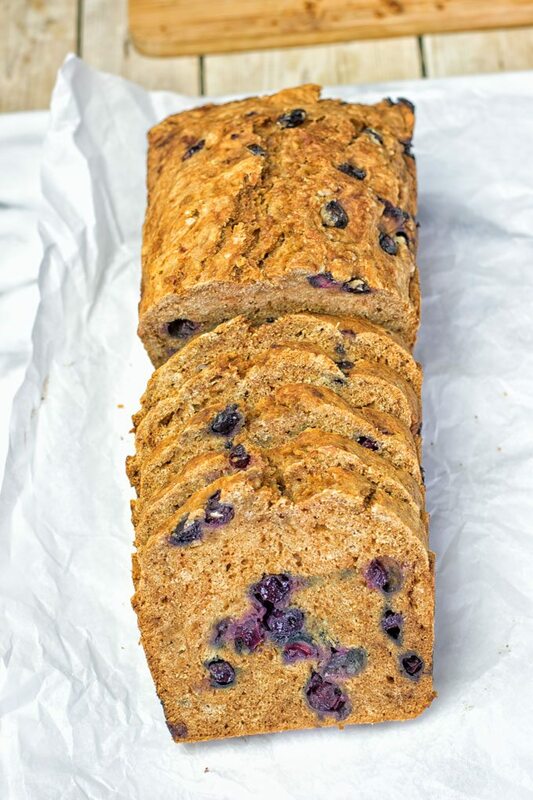 This is best blueberry bread for all the good reasons. Come on board and enjoy. Let’s get started so that you can prove I’m right. 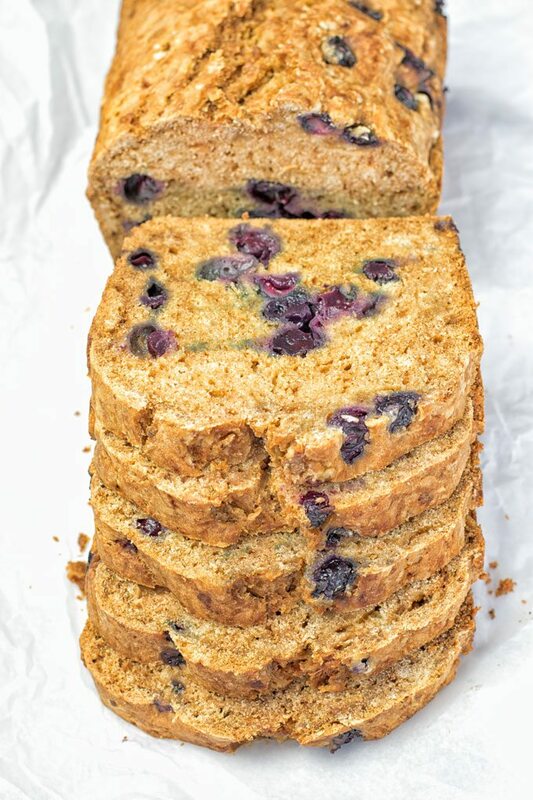 All we need is six ingredients: light buckwheat flour, fresh blueberries, applesauce, melted coconut oil, coconut blossom sugar, and baking soda. Combine all the ingredients in a bowl and mix carefully with a spatula until a dough is formed. Be gentle, you don’t want to mash the blueberries. Put the dough into a baking dish prepared with parchment paper (or greased with a bit of oil). Cover the pan with aluminium foil and bake at 375°F for 60 minutes. It’s really important that you cover the baking pan with aluminium foil. Otherwise it could happen that the blueberries will get a bit dark or even burn. Also please make sure to follow the precise baking time. I tested the recipe a lot and found out that a less baking time leads to an under-baked result. The same with baking longer: it wasn’t nearly as juicy and tended to get a bit darker. You will taste the difference either way by one single bite. And I don’t want this to happen to you. So with 60 minutes it’s precise and accurate, and leads to right texture. What I love about this bread, besides it’s flavor and how easy it is to make, is how absolutely versatile it is. It’s not just your typical dessert or cake. It’s good for breakfast, for a snack, or even a unique lunch. This homemade bread you can serve even your pickiest kids. Yes, it will be a new family favorite, trust me. Plus best part is baking with your kids is so much fun. It is an amazing idea to make this with your kids together. They will surely enjoy the process, at least if they recognize the delicious smell fresh from the oven. Not only are blueberries symbols of summer, these powerhouse are full of amazing benefits. They are said to contain nutrients that help your memory. So if you forget something, which might happen from time to time, eat some blueberries and you will remember not only the delicious taste. Also these beauties are high in antioxidants, and an immune booster. Plainly, they are just good for you. 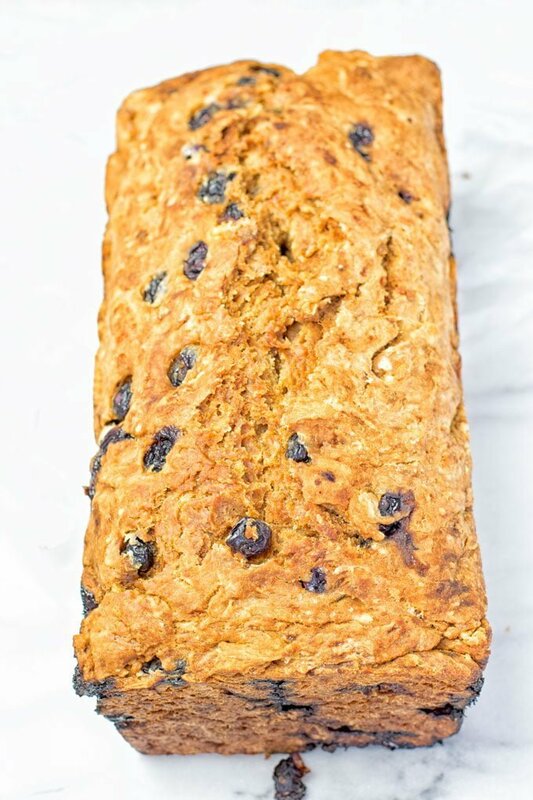 I could list many more fantastic facts why you should make this Gluten-Free Blueberry Bread, but I’m sure you doesn’t need to be convinced any more. It speaks for itself, friends, but if you’re enjoying and having fun to get to know more, check “7 Health Benefits of Blueberries“. If you try this, give me a tag on Instagram and Facebook, love seeing all your remakes. Happy baking, see you soon, Florian. I just made this and unfortunately, when I flipped it out of the loaf pan and tried to flip it back over, it broke into chunks/fell apart! Thoughts? Hi Brianna! I made this often with light buckwheat flour and never had this issue before. Can you tell me which flour you used? Hi Kat! I would use another fruit sauce, like pear or mango. Also you can use more oil as well. Hi Dynell! Please do not use more than 1/2 cup of coconut flour. It will not work for the taste and texture. You will need 2 cups in total of flour. Use another flour for it like light buckwheat flour. Hope that helps!